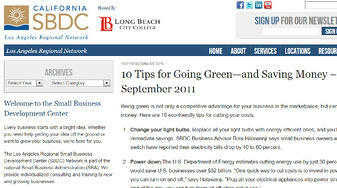 These tips are taken from the SBDC newsletter dated September 2, 2011. With these tips, we agree and further, have a few points to add which may help you decide when and how much Green is appropriate for your business. Being green is not only a competitive advantage for your business in the marketplace, but can also save you money. Here are 10 eco-friendly tips for cutting your costs. Yes, please make sure they are not mercury-vapor based light bulbs because when they go to the trash/recycling center, they are full of poisonous mercury. Remember the water table. Yes, getting your enterprise power reductions by virtualizing and consolidating servers and PCs to gain a reduction of up to 30 to 1 in energy consumption. This means 30 servers/PCs can be housed in one physical unit. Another way to reduce is switching to cloud-based virtual-computing. 3. Buy green equipment. Look for the Energy Star symbol when you buy computers, monitors, phones or audio/video equipment. You can find a list of green equipment at www.EnergyStar.gov. Yes, old equipment, 3-5 years old is less energy efficient than systems less than two years old. Green initiatives, doing more-with-less, is commonplace for today’s electronic devices. What, five years ago, took 600 watts to power; today can be done for about 250 watts. Combine this with virtualization and consolidation; your savings are even greater. 4. Digitize. Do you really need a hard copy of every document? Use an online backup service to store your data in the cloud. This not only saves paper and toner, but also keeps your crucial data safe from disasters and easily accessible. YES, getting your folders/files in sync does more than save energy and resource costs. It allows you to strategize on historical hierarchies for better data management and audit controls. This style of document management system is key to finding and using valuable corporate information stores, assists with SARBOX compliance and allows peace of mind your data are safe. 5. Limit printing. A typical office discards almost 350 pounds of paper per employee per year, says Halawanji. If you must print, save ink, paper and money by using software such as Greenprint, FinePrint and HP Smart Web Printing to eliminate waste. YES, printing today is becoming an afterthought not the first thought. In addition to not printing, data systems today utilizing dashboards, streaming analytics, makes printing almost obsolete. Doing less printing and using your technology resources within your ERP software can save money quickly. 6. Repurpose paper. Save even more by using the blank sides of discarded documents for scrap paper. Use a shredder to shred non-critical documents and use them for packing. Yes, many companies offer on-site shredding and actually may pay you for your wasted paper. If your scrap paper does not contain any company sensitive information, it can be used as packaging paper. If it does contain sensitive or confidential data, you might consider a shredding service. 7. Get help from the government. “Almost every state, county and large municipality has at least one program to help small companies reduce energy, waste or water use, and thus cut costs,” says Halawanji. For a state-by-state directory of incentives, visit www.dsireusa.org. In L.A. County, programs like Energy Upgrade California (https://energyupgradeca.org) offer rebates, incentives and tax breaks for energy-efficient upgrades. YES, getting an energy audit may help you see areas of reducing waste and over consuming energy. Consider all of the wall-adapters and cords for devices not charging/in-use when you are out of the office. Lights in areas not requiring constant illumination may be candidates for auto-on/off light switch sensors, for example. 8. Get audited. Need more help coming up with energy-saving ideas? Most utility companies will provide a free energy audit. Typically, an auditor tours your business and suggests ways to reduce energy costs. Yes, this is a way to get started without a heavy investment in remodeling or renovating the building and or factory. With an overview based on facts and well studied plan and compromised based on what is doable and practical. When you have the “big picture” it is easier to see what you can do in stages and what will give the best payback in the shortest time. 9. Look for a green building. Ready to move or expand? Halawanji explains that green building methods, including increased ventilation, reduced air recirculation, improved filtration and reduced occupant density, can significantly decrease work-related illnesses and absences, saving your business money. YES, if you have out grown or are in need of reduction, studying the landscape to uncover energy efficient buildings and factories will further ensure savings downstream. If you cannot save or improve your energy savings, consider renovating your existing facility as an alternative. 10. Enlist employees. “A positive and proactive green position builds loyalty not only among customers, but also within your own work force,” says Halawanji. To get employee buy-in, she suggests establishing a staff committee to implement small steps, and incentivizing good ideas and solutions. Yes, getting the “company” on board and bringing consciousness to consumption makes for a better workplace, empowers and gains ownership from each employee. When someone knows and believes they can make a difference, their contribution is rewarded. Rieva Lesonsky is founder CEO and President of GrowBiz Media, a media company that helps entrepreneurs start and grow their businesses. Santa Clarita Consultants is an authorized VMware and SYSPRO partner. VMware is a server-based virtualization and consolidation technology offering strategic advantages over standard system/server-per-function methodology. Our customers, which take advantage of VMware system virtualization and consolidation, have achieved greater stability, security, resilience, compliance and trust in their technology and infrastructure domains. For more information or to request our four point site-audit, The Enterprise 4X4™, please follow the links below.